Scooper - Lifestyle News: Why do people dip a cookie in milk? Why do people dip a cookie in milk? 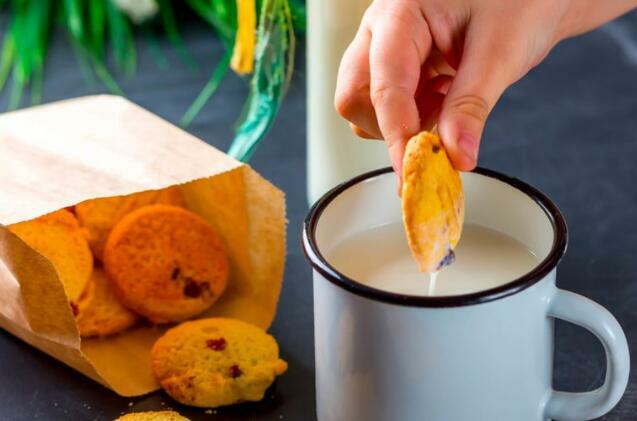 Not even adults can deny that dunking cookies in milk is one of the best treats out there. Whether it’s with the perfect chocolate chip cookie or any other type of cookie Grandma would be proud of, the classic combo is a recipe for happy taste buds and sweet nostalgia. In fact, eating cookies with milk is scientifically designed to taste good. Whether the first person to ever dip a cookie in milk knew that is another question. When you dunk a chocolate chip cookie, you change everything about it: the texture, the flavor, right down to the chemical composition. As Matthew Harting, a chemistry professor at American University, explained to Quartz, the secret is a group of chemical additives called emulsifiers. Here's how they work. There are some liquids that don’t naturally mix, the most common example being oil and water. An emulsion is when one liquid is chemically forced to disperse within the other. Instead of oil sitting on top of water, drops of oil are suspended throughout the water. The compounds that make this happen are called, you guessed it, emulsifiers. One end of this molecule likes oil and the other end likes water, so they allow two otherwise opposing liquids to happily coexist. Both chocolate and milk contain emulsifiers. The ones in chocolate let fatty ingredients (oil and cocoa butter) mix with ingredients without fat (water and cocoa powder). They also keep the fat in milk from collecting at the top of your glass. This delicious magic, aka science, is taken to the next level when chocolate chip cookies are dunked in milk because the emulsifiers from both substances interact on your tongue. Milk calms down the intense sweetness from the chocolate, Harting said, and emulsifiers “help to smooth out the chocolate as you’re eating it,” giving you the perfect creaminess-to-cookie flavor ratio. Otherwise, it could taste too gritty and crunchy. So the next time you dip a cookie in milk—generating chemical reactions that bring a new cookie creation to life—congratulate yourself. You’re basically the Dr. Frankenstein of food.